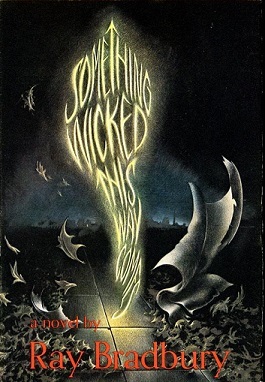 If you’re in the mood for a solidly spooky book, we recommend Something Wicked This Way Comes by Ray Bradbury. I mean, if you’re into horror or creepiness and haven’t read it yet, we really don’t know what’s wrong with you, but this is the story that sets up the evil-circus-comes-to-town. And because it’s Bradbury, his words don’t need us to get in the way of them. Here’s a section of Chapter 37 where Charles Halloway goes to the library and assembles a collection of books in order to better understand the evil that arrived by rail. An autumn leaf, very crisp, fell somewhere in the dark. But it was only the page of a book, turning. Off in one of the catacombs, bent to a table under a grass-green-shaded lamp, lips pursed, eyes narrowed, sat Charles Halloway, his hands trembling the pages, lifting, rearranging the books, Now and then he hurried off to peer into the autumn night, watchful of the streets. Then again he came back to paper-clip pages, to insert papers, to scribble out quotations, whispering to himself. …Wet all over, cold to the bone, before night caught him he let the crowd protect, warm, and bear him away up into town, to the library, and to most important books …which he arranged in a great literary clock on a table, like someone learning to tell a new time. Go to a circus or festival, anywhere with a mirror maze or a carousel. Listen to the Dans Macabre. Previous Treat Yo Self Day (Oct 13). Next Charlie goes to his first real party (Oct 28, 1991).